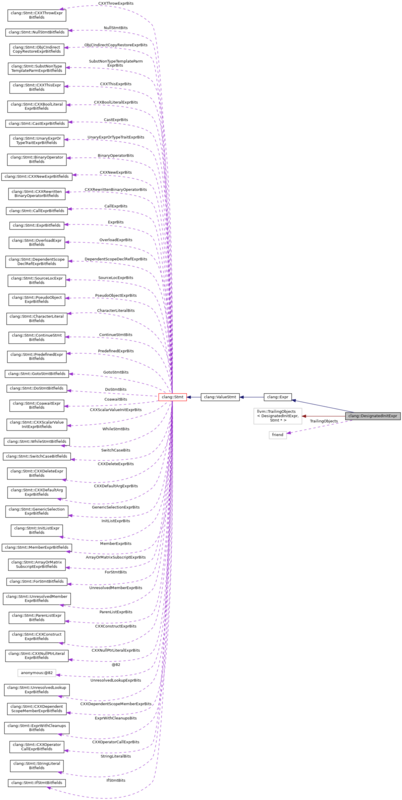 The InitListExpr contains three DesignatedInitExprs, the first of which covers .y=1.0. This DesignatedInitExpr will have two designators, one array designator for  followed by one field designator for .y. The initialization expression will be 1.0. Definition at line 4453 of file Expr.h. Definition at line 4726 of file Expr.h. Definition at line 4730 of file Expr.h. Definition at line 4721 of file Expr.h. Definition at line 3942 of file Expr.cpp. Referenced by CloneDesignatedInitExpr(), and clang::ASTNodeImporter::VisitDesignatedInitExpr(). Definition at line 3954 of file Expr.cpp. Definition at line 4656 of file Expr.h. Referenced by CloneDesignatedInitExpr(), isImplicitThis(), and clang::ASTNodeImporter::VisitDesignatedInitExpr(). Definition at line 4660 of file Expr.h. Replaces the designator at index Idx with the series of designators in [First, Last). Definition at line 4016 of file Expr.cpp. Definition at line 3997 of file Expr.cpp. References clang::Designator::ArrayDesignator, clang::DesignatedInitExpr::Designator::ArrayOrRange, and clang::DesignatedInitExpr::ArrayOrRangeDesignator::Index. Definition at line 4008 of file Expr.cpp. References clang::DesignatedInitExpr::Designator::ArrayOrRange, clang::Designator::ArrayRangeDesignator, and clang::DesignatedInitExpr::ArrayOrRangeDesignator::Index. Definition at line 4002 of file Expr.cpp. Definition at line 3978 of file Expr.cpp. 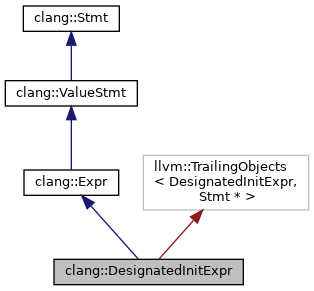 References clang::DesignatedInitExpr::Designator::ArrayOrRange, clang::DesignatedInitExpr::FieldDesignator::DotLoc, clang::DesignatedInitExpr::Designator::Field, clang::DesignatedInitExpr::FieldDesignator::FieldLoc, clang::First, clang::SourceLocation::getFromRawEncoding(), clang::DesignatedInitExpr::Designator::isFieldDesignator(), and clang::DesignatedInitExpr::ArrayOrRangeDesignator::LBracketLoc. Definition at line 4664 of file Expr.h. Referenced by ExpandAnonymousFieldDesignator(), and getDesignatorsSourceRange(). Definition at line 4665 of file Expr.h. Definition at line 3970 of file Expr.cpp. References clang::DesignatedInitExpr::Designator::getBeginLoc(), getDesignator(), clang::DesignatedInitExpr::Designator::getEndLoc(), and clang::DesignatedInitExpr::Designator::getSourceRange(). Definition at line 3993 of file Expr.cpp. Retrieve the location of the '=' that precedes the initializer value itself, if present. Definition at line 4678 of file Expr.h. Definition at line 4687 of file Expr.h. Referenced by CloneDesignatedInitExpr(), isImplicitThis(), clang::EvaluatedExprVisitorBase< llvm::make_const_ptr, ImplClass >::VisitDesignatedInitExpr(), and clang::ASTNodeImporter::VisitDesignatedInitExpr(). Retrieve the total number of subexpressions in this designated initializer expression, including the actual initialized value and any expressions that occur within array and array-range designators. Definition at line 4699 of file Expr.h. Definition at line 4701 of file Expr.h. Definition at line 3961 of file Expr.cpp. Definition at line 4679 of file Expr.h. Definition at line 4684 of file Expr.h. Definition at line 4691 of file Expr.h. Definition at line 4706 of file Expr.h. Returns the number of designators in this initializer. Definition at line 4653 of file Expr.h. Determines whether this designated initializer used the deprecated GNU syntax for designated initializers. Definition at line 4683 of file Expr.h. Definition at line 4735 of file Expr.h.